Our big move is less than a week away and we are busy, exhausted, excited... you get the picture! I can't wait to let Barkley run in his very own yard for the first time. I think we are honestly both so happy to finally be moving to a house that we could burst! The only thing raining on our parade (aside from the fact that we're not finished packing... and when my mom reads this, I bet she'll drive to our condo with more boxes and insist that I let her help.) is the fact that there are some major projects that need to be completed immediately. Between installing central air and refinishing the floors, (... not to mention, some landscaping, electrical, plumbing and many other projects) we may not be able to actually paint and decorate for weeks! One thing keeping me motivated is the idea that, even if the rest of the house is in a state of boxes and chaos, we can work on one room at a time. I think we'll begin with the living room since it's an easy room and it will make a big enough impact to make us feel like we've accomplished something once it starts to look good. 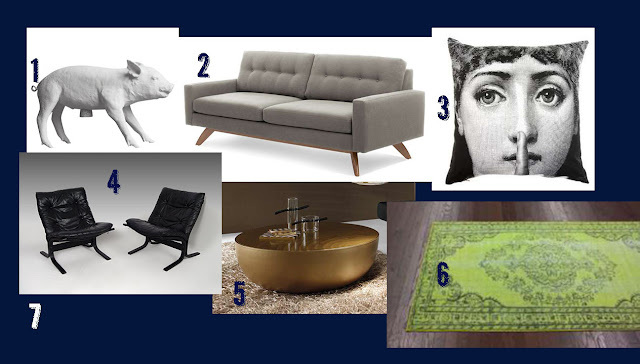 We already have our gold coffee table and siesta chairs as well as our Harry Allen piggy bank and Fornasetti pillow. I've mentioned in the past that I've always dreamed of having navy blue walls in my living room and I've already decided on gold metallic accents. I wanted at least one or two more accent colours to keep the room from looking too boring. So far, I think I'm leaning towards the lime green in the first but I'd like to incorporate a few pops of deep purple and teal as well. I will also have warm wood tones in both the furniture and the accents. What do you think? 1. We already own this white Harry Allen Piggy Bank but we love him... and he has a name. 2. This Design House Grey Sofa resembles the sofa we already have. 3. Our Fornasetti Pillow is a current favourite of ours and we plan to give her a place in our new living room. 4. As you know, these Ingmar Relling for Westnofa Siesta Chairs will take the place of our director's chairs as living room seating. 5. This Go Modern Planet Coffee Table reminds us of the gold table we found (for a much better price) on Craigslist. 6. I really like this Green Overdyed Rug from Overstock.com. 7. While, I'm not sure of the exact paint colour we'll end up using, Farrow & Ball Drawing Room Blue is fairly close to the hue I imagine. 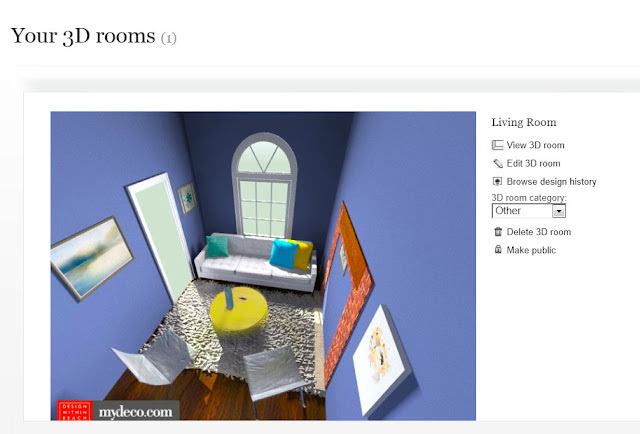 In the past, I blogged about using a virtual room to play with wall paint colours, another great resource for room planning is the Design Within Reach 3D Room Planner. 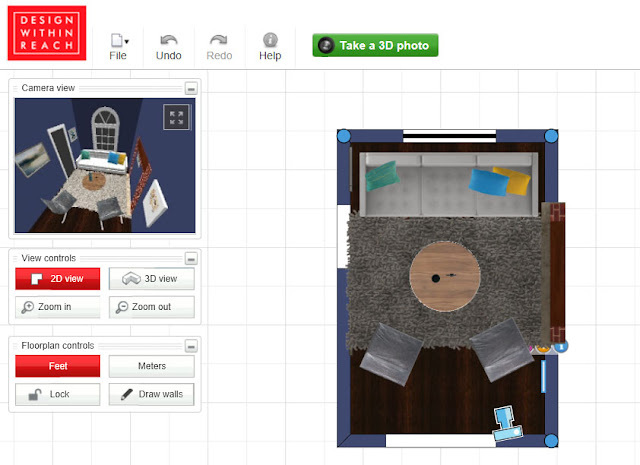 The planner allows you to use the exact dimensions of your room (although I just estimated) and even plug in features like doors and windows. You are limited to using their furniture, so I had to find options similar to the pieces I already had. As you can see, it allows you to place a virtual camera at a point in the room, so that you can get a real sense of how everything fits together. I used a little photoshop to make the coffee table seem more gold, but I wasn't thrilled with the depiction of my colours. I also don't really know what happened with my mantle... I may have "installed" it backwards. 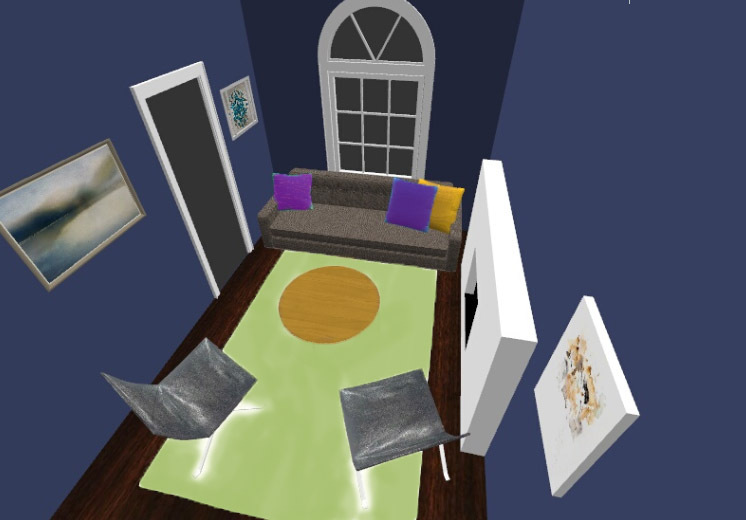 In the image below, I ended up darkening the walls, photoshopping the rug and changing its orientation in the narrow room. I think this last room is much closer to what I want but it's still not quite right. I keep going back an forth in my mind about colour palettes and I'm not fully sold on any of them. I think I'll need to wait until I'm in the space to make the call. I should also consider what I might do with the dining room since it's visible from the living room. My mother often speaks fondly of a dining room in her old house, which was painted "bottle green" and I'm wondering if I would consider a similar, emerald tone. I think it's Pantone's "Color of the Year"... At least it's a good place to start.